Hello friends! My name is Tim Welsh. I’m the owner and operator of Welsh Income Tax Service in Hayward, California. When I was fifteen, I fell in love with San Francisco. It wasn’t a first in the family; my mother at seventeen had traveled by train from North Dakota, where I was later born, to see the Treasure Island World’s Fair, and fell in love with “The City” long before I did. You can see pictures from her trip in the November 19th, 2014 ‘Summer of 1939’ postings. It’s been a love affair that’s never broken my heart. 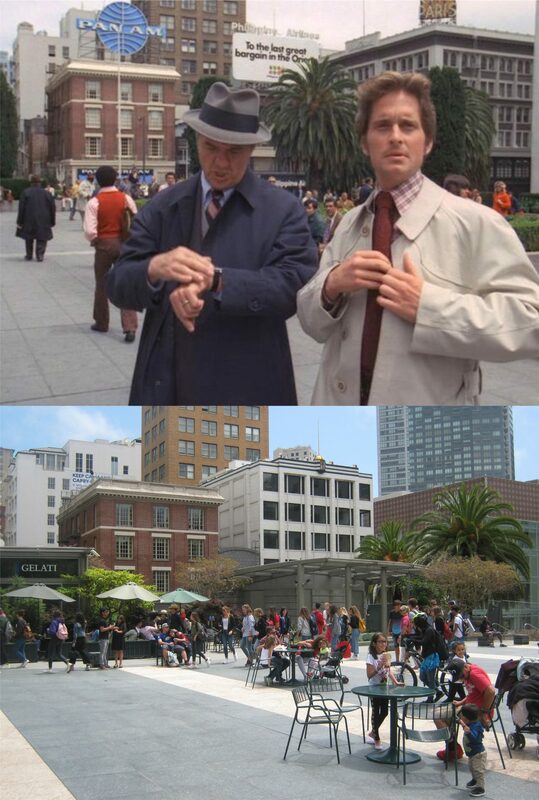 Here, with pictures from books, movies, the internet, and personal collections, I’ve had a chance to share my affection for San Francisco with comparison and location pictures that I’ve taken. I’ve had help from family and friends, and even my dog ‘Danny’ who sniffed out the trail of Buffalo Bill at Ocean Beach on a November 15, 2014 post. My blog is for non commercial and non profit purposes only, and it’s always a lot of fun to work on. Many of the pictures from November, 2014 to November 2015 are thumbnail images. Pictures from posts after that can be enlarged by viewing the image. I hope you enjoy the posts, and please feel free to follow my blog, or make suggestions, comments or corrections if you like. I haven’t been able to take the Martin Luther King Jr. Holiday off very often since I took over my dad’s income tax practice 25 years ago after he died. The holiday usually falls on what is a busy day preparing tax forms. However, since the Internal Revenue Service has once again postponed the inevitable for the fourth or fifth year in a row and won’t process any tax returns until near the end of January, I decided to take the day off yesterday and head to the Coast; the west coast of San Francisco. A trip to the coast may conger up images of the Lewis and Clark Expedition or the Joad family in ‘The Grapes of Wrath’ but when traffic is light, like on holidays, I can get to the San Francisco coast from the office in less than an hour. There were “Dangerous Waves” warnings all along Ocean Beach yesterday, and a number of beach locations were closed. My picture was taken from right behind the Cliff House. The view along the coast south of the Cliff House in 1865: You can see the two peaks in the ridge that runs down to the beach from here in both pictures. I think that the only known survivor of Carville is in the center top of my picture on the Great Highway between Lawton and Moraga Streets. Those are two old streetcars side by side in the frame of that building behind the garage. The pool, built in 1924, closed in 1971, when the vintage picture here was taken, and was filled in. It’s now beneath the parking lot to the San Francisco Zoo. I took my picture of the pool house in September of 2012, just before it burned down in a fire caused by homeless people living in the abandoned building. I suppose I could fall into the category of a pseudo-dilettante. I was watching an old television show recently where a client who’s hiring Peter Gunn to find somebody who ripped him off, refers to the suspect as a “dilettante”. I looked the word up to see if it meant what I thought it did, which is a pseudo-intellect’s way of saying one isn’t sure of the meaning. The dictionary reads a dilettante is a person who takes up an art, activity or subject merely for amusement especially in a desultory way; a dabbler. That could be me pertaining to my picture taking. I wasn’t sure about desultory being accurate, so I looked that up too. The dictionary reads that desultory is lacking a plan, purpose, or enthusiasm. No, that doesn’t fit. My enthusiasm is a driving force when I’m tracking down picture locations, and my purpose is to enjoy myself. So, I looked up pseudo, which came to my mind, to see if I qualify for that slander. (This is all going somewhere, isn’t it?) Pseudo is being apparently rather than actual. This brings me back to my opening. Today’s entry is a collection of vintage driving and parking pictures around San Francisco, posted by a possible pseudo-dilettante. Union Square in the 1960’s: You can drive around there for hours today, and probably back then too, looking for parking if the Union Square Garage is full. Green Street, where it meets Columbus Avenue and Stockton Street in the 1940’s: I took my picture while passing by from a bus on the Number 30 Muni Line coming back from Fisherman’s Wharf last October. We thought that was funny when we were kids, even though it doesn’t make sense; if you go by the weather reports, Hell isn’t supposed to be cold! However, San Francisco has been for the past two weeks. Looking down California Street from Powell in the 1960’s: I would rather to have gotten a cable car coming up instead of heading down, but you can’t stand in this spot too long without getting honked at or worse! Although, that didn’t seem to bother this cutie an awful lot! Sacramento Street looking down from Powell Street: It’s a long way from the spring of 1983 to January 5th 2019 when I took these two pictures. 1939 was a milestone year for San Francisco and the world; San Francisco staged the last World’s Fair it probably will ever have, World War Two broke out, and also 1939 saw the first member of my family ever to visit San Francisco. I haven’t counted, but I’ll bet the year of 1939 has the most vintage pictures I’ve posted on my blog. These are a collection of some of the pictures from 1939 that I’ve done comparisons on. We’ll open up with a 1939 map of the 49 Mile Scenic Drive from the San Francisco Downtown Association, and a current map of the Scenic Drive that shows where the route varies from the original drive today. It also shows that map drawers today show less creativity. Dorthea Lange was a photographer famous for her pictures taken during the Great Depression of the 1930’s. In 1939 she took a number of pictures in San Francisco, including this one from the ramp of the First Street exit off of the Bay Bridge, now called the Fremont Street exit. You can see Coit Tower, the Shell Building, the Standard Building, and the Russ Building among other landmarks in her picture, none of which are visible from here today. In another Dorthea Lange photo taken on the same day in 1939 as the previous picture, you can see the Key System train tracks along with a train that ran from the East Bay across the Bay Bridge and into the Transbay Terminal. The Fremont off ramp, seen in my picture, follows the same path as it did in 1939. Dorthea would have taken her picture near where the Fremont and Folsom street signs are in my picture. An artist’s rendition of what the Transbay Terminal that opened in 1939 would look like, and the Transbay Terminal on the last day before it closed forever in August of 2010. The Transbay Terminal lasted for over 70 years. The Transit Terminal, that replaced it and opened in 2018, lasted a little over 7 weeks before it closed indefinitely. An auto navigates the portion of Lombard Street know as the “Crookedest Street in the World” in 1939. A lady waiting for an auto, bus, streetcar or cab at on Market Street at Jones in 1939. I don’t know if that coat, whatever it was made from, would go over too well nowadays. Groundbreaking for the Golden Gate International Exposition on Treasure that opened in 1939: Notice the flags of Japan and Germany; fifteen months after the Fair closed in September of 1940, America would enter World War Two to fight these two countries. Hollywood visited the Treasure Island Fair in the 1939 film ‘Charlie Chan at Treasure Island’ with Sidney Toler playing Charlie Chan. The Cantilever Bridge that ran from Yerba Buena Island to Oakland is in the background across “Clipper cove’ in both pictures. Clipper Cove got its name from the Pan Am Clipper Seaplanes that took off and landed here during the Fair. The new Eastern Span, still being constructed in my picture, opened during the summer of 2013. ‘Charlie Chan at Treasure Island’ has a scene that features a fly over of Treasure Island showing the Fair from a Clipper plane and some landmarks like the Sun Tower and the Administration Building. The Administration Building, an airplane hanger, and the Palace of Fine and Decorative Arts Building, seen here, are the only three surviving structures from the Fair. I have a few mementos from the Treasure Island Fair that I picked up at a museum sale over 50 years after the Fair closed; a coaster and an official tour book. However, most dear to me was that my mother, as a teenager, took a train from Grand Forks, North Dakota to spend the summer of 1939 in San Francisco. She stayed with her aunt at this house on the corner of Anza Street and 24th Avenue in the Richmond District. My mom, on the left, is sitting with her cousin Frances. I remember my mom telling me how close she and Frances were, but by the 1990’s they had lost touch with each other forever.